In the early years, the Cherokee Indians roamed the area now known as Sharps Chapel. This is most evident by the numerous arrowheads and other artifacts the Whaleys have found around their home. Henry Sharp received a land grant of 700 acres for his service in the Revolutionary War near where the Powell and Clinch Rivers meet. Henry Sharp and his son Conrad built a log cabin on a hill near a large spring. Soon, several log structures went up around it creating a sort of commune. As logs were floated down the rivers to Chattanooga, it is believed that this site was used as a layover for loggers. Some speculate that Daniel Boon and his son Isiah were among the people who stayed at the layover. Henry Sharp's grandson Jacob built a fine brick mansion on the property in 1835. The structure was built by slaves who were highly skilled and trained in the craft and traveled the territory building homes. The bricks used to build the home were molded and fired just behind the house. Hand crafted wanes coating, mantels and cabinetry are original to the home and a fine example of the craftsmanship of the era. During and after the Civil War, Jacob Sharp fell upon hard times. He sold the house and property to Jacob Ousley and moved to Friends Station in Jefferson County where he is buried. 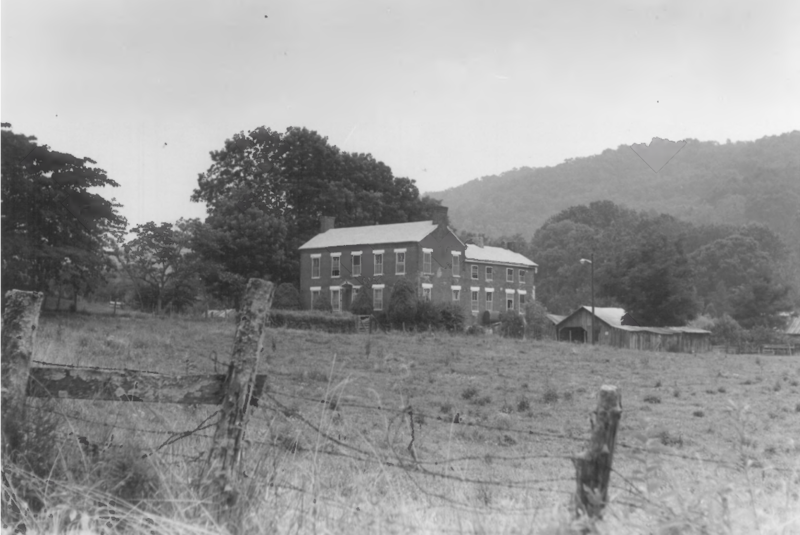 Jacob Ousley's children were born in the house as were his grandchildren who still own 400 of the original 700 acres. Jacob was a Methodist Minister and successful merchant at the time. Beginning in 1970, the house languished unoccupied for almost 30 years and was considered to be a 'haunted house'. A large barn was built on the hill north of the house. Much of the interior is built from logs that apparently were previously used in other structures. This is evident from the old half dove tail cuts that exist randomly in the logs. Setting next to the barn is one lone cabin having been moved there from another site. It is reasonable to believe that this was the cabin that Henry Sharp originally built and lived in as it would have been the most likely structure to have been saved. Dave and Tomica Whaley purchased the house in 2005 and that's when the restoration began. They bought the house, a mobile home, and two giant, handmade tarps to cover the house as the roof was gone. The mobile home was placed on the property close to the house and that's where they lived until the back half of the house was renovated. They soon learned there was an abundance of snakes on the property, having taken up habitat in the over growth in and around the house. Dave realized this when he saw a huge, long black snake curled in a bundle up in the tree out back. It fell to the ground and slithered away leaving a lifeless little squirrel. On another morning, he goes outside to find the heart of some unidentifiable critter lying on the walkway. That's when he turns to Tomica and says "we're not in Old North Knoxville anymore". Read how Dave and Tomica came about finding this beautiful place and how the house chose them to be its residents and keeper in part II of this story in the next edition of Historic Union County.